It might have been slightly chilly out, with temperatures in the 50’s, but that didn’t stop me from trying stand up paddle surfing (SUP) on Lady Bird Lake this weekend. I had a lot of fun when I tried it while I was living in Hawaii and I had a desperate need to be on a board again. 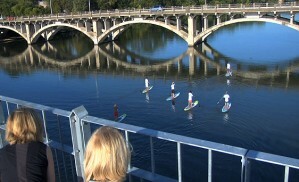 SUP ATX (Stand Up Paddle Austin, Texas), conceived by Nick Matzorkis in 2008 and launched as a company in the summer of 2009, is the group responsible for bringing paddle surfing to Texas. He discovered paddle surfing during a two-year extended stay at his vacation home in Malibu, CA at a Becker surf shop managed by former professional long board surfer Mitch Taylor. While there purchasing a surfboard for his son, Nick inquired about the huge “surfboards”, which Mitch explained were stand up paddle boards, something Nick had seen a small handful of people undertaking, but had not yet had the opportunity to try for himself. He took one out into the water, instantly fell in love with the sport, and, becoming convinced that anyone else who would try it would feel the same way, decided to make introducing and popularizing the sport his life’s work. Ever since, he has been spreading his enthusiasm for paddle surfing from Malibu to the Central U.S. You can see the journey at their website. I found the SUP ATX group through Facebook and immediately became a fan. From there, I joined their meetup.com group. The group meets every Saturday at 10:00am at Lady Bird Lake, under the Mopac bridge, for a free demo offered to all. I met Mitch, who has since left his position of 17 years at Becker surf shop and is now an employee of SUP ATX, at the February 20th meetup under the Mopac bridge. He had everyone in the group sign a waiver and led a brief introduction to paddle surfing. Mitch helped each one of us onto our boards and, with a little push, sent us on our way. After sending us out into the lake, Mitch and other SUP ATX representitives paddled next to each one of us to make sure we were doing okay and to give us some paddling tips. From the moment I stepped on the board to moment I got off (about an hour later), I had a great time. Not only was I on a board again, but I got to peacefully paddle around Lady Bird Lake, although we did get some very inquisitive looks from runners and rowers alike. Paddle surfing is a total body workout. You use your shoulders, core, arms, back, chest to paddle and your legs and core to keep you balanced upright on the board. Luckily, no one fell into the cold water. 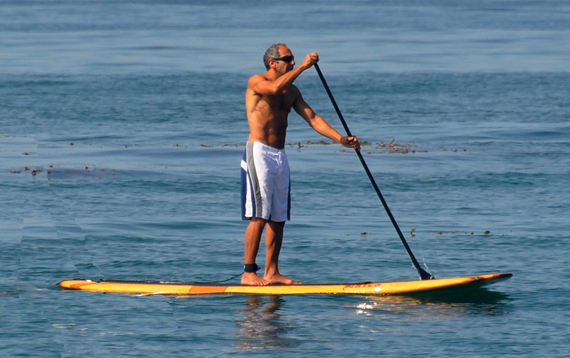 Not only do you get a great workout paddle surfing, but you have a great time doing it. How cool is that? I would highly recommend paddle surfing to anyone who wants to try a low impact activity, stay in shape, and have a great time on the water. Before starting a workout program consult a physician.